Selectively named the 'pearl of Africa' by Sir Winston Churchill, Uganda is indeed a naturally beautiful tourist destination, you must visit. Uganda is a land-locked country located in East Africa and the source of the great River Nile, the longest river on the planet. The country is blessed with a number of wildlife attractions that can be explored and enjoyed by tourists looking for a true African wildlife adventure. A drive from Kampala City, Uganda’s capital towards the countryside, you will be introduced to the true natural beauty of Uganda, as you adventure into the major wildlife wonders the pearl has to offer. From Kampala to the source of the River Nile in Jinja, one goes through the splendid Mabira Forest, one of the huge natural forests in Uganda. Split through by the Kampala Jinja highway, Mabira Forest is of an unmissable eco-tourism destination. The forest is home to a number of wildlife species, including over 300 bird species, primates like baboons, monkeys, mangabey, and a number of butterflies and insects among others. Tourists visiting the Mabira Forest Reserve can engage in a number of adventure activities like primate tracking, forest walks, birding among others. Just after Mabira, you will come across the great River Nile, the longest in the whole world in Jinja in its source where it forms a number of rapids. Adventurous tourists can go white water rafting across the five different stages of the rapids, including the most thrilling stage where the rafting boat is over turned by the great force of the waters of the Nile. White water rafting is not for the fainthearted but it is quite a thrilling adventure for many tourists. While on a Jinja source of the nile tour, one has got lots of options of activities to per take in, take for example boat cruise to the source of the River Nile, go bungee jumping or even horseback riding. Exploring Murchison Falls National Park comes with yet another thrilling adventure with amazing scenic views of the Murchison Falls that forms a permanent rainbow. The falls can be explored while on a launch that takes tourists to the bottom of the falls. You can also hike to the top of the falls for clearer views. Home to over 75 mammal species and 450 birds, Murchison Falls National Park is surely one place in Uganda that offers a great opportunity for a Uganda wildlife Safari. While in on a Uganda Safari to Murchison Falls national park, one cannot miss seeing elephants, giraffes, buffaloes, Nile hippos, crocodiles, antelopes, baboons and many other species. There are many other savannah national parks in the country where one can view other wild animals while on game drives and boat cruises take for example Queen Elizabeth National Park in the South-Western side of the Country. The critically endangered mountain Gorillas in the forests of Bwindi Impenetrable and Mgahinga Gorilla National Parks are other natural wonders one should not miss while on a Safari to Uganda. These gentle apes are highly endangered and the total population remaining on the planet is estimated at a mere 900 of them. Bwindi Impenetrable Forest National Park has half of the mountain Gorillas over 450 with 12 habituated mountain Gorilla families that are open to tourist for Gorilla trekking safaris. Each mountain Gorilla family can only be visited by a group of 8 tourists a day. This group treks through the forest to search for a specific mountain gorilla family, with whom they spend an hour learning more about them and taking photographs, call it Gorilla tracking experience. 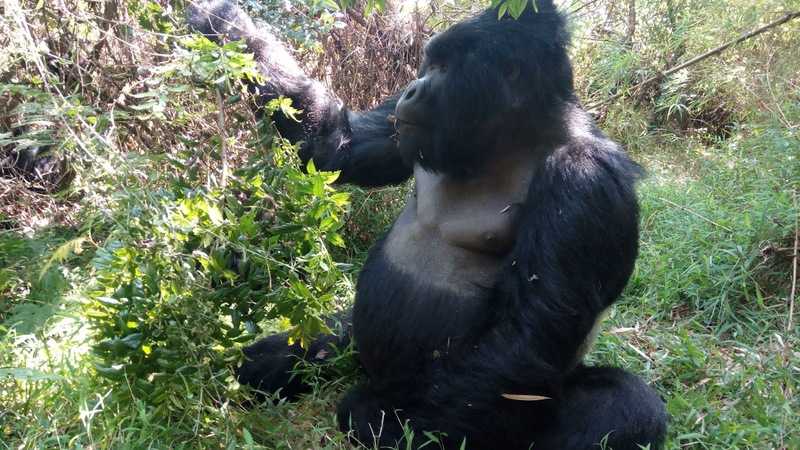 Spending time with these critically endangered species in the wild on your Gorilla Safari tour in Bwindi is fascinating and exciting and is truly an experience one should not miss while on a Uganda safari Tour. All these remarkable wildlife experiences in Uganda can be enjoyed all year round. And what makes the wildlife experiences special in Uganda are the very hospitable and welcoming people, especially the guides who are committed to take the tourists around and have considerable knowledge and information about the major wildlife species.